Available from Amazon and Smashwords in e-book format for only $4.99 and print for $19.99. Print copies are also available in all good bookstores or by contacting me on marty [@] martyyoung.com. Explore Australia’s dark literature past, present, and future all in one landmark anthology. 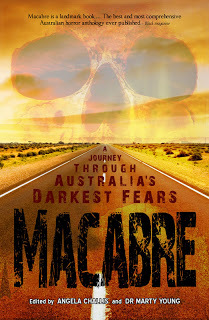 Macabre is a snapshot of the fears that have gripped Australians for over 200 years: the isolation of the bush, monstrous fauna, supernatural terrors, violence, war, terrorism, alienation, cannibalism, and murder. From the very earliest colonial ghost stories through to grim tales of modern life, Macabre will take you on a journey through the terrifying heart of Australian horror. At a massive 672 pages, with a detailed essay on the history of Australian horror, an Australian horror fiction timeline, and 38 stories from three eras (classics, modern masters, and new era originals), Macabre is, without doubt, the most significant anthology of Australian horror ever published.